I enjoyed The Grand Budapest Hotel so much I have already watched it 4 times and even made my children watch it. This is a movie where each frame is a multi layered construction. The more times you watch it, the more things you notice, the greater the enjoyment. The three-tiered pastry in Grand Budapest Hotel is amazing. It weaves itself throughout the story. It saves people’s lives and helps others escape out of prison. Not only is this food item a character in the movie. It is the definite hero of the narrative. If I was to write my own Grand Budapest Hotel what food would I put into the story? Well! I don’t know how to make pastry, but I do know how to make meatballs. Started with beef liver dumplings, ginger turkey meatballs and onion beef kufta. Tri color béchamel sauce and garnished with capers, dried cranberries and pine nuts. I laboured the whole day working on it, it tasted heavenly. A meat lovers opera in three acts. The movie pastry is called Courtesan au Chocolat I think I will call my version Novelist à la Béchamel. This is the first creation of what I hope will be several where the East-West cultural clash is expressed through a recipe. You could say that I am on a quest to find a recipe that will make me believe in world peace. The liver dumplings are inspired from a Czech liver dumpling soup my grandmother used to make (polevka z jatrove knedlicky). The ginger turkey meatballs are inspired by North American cuisine. 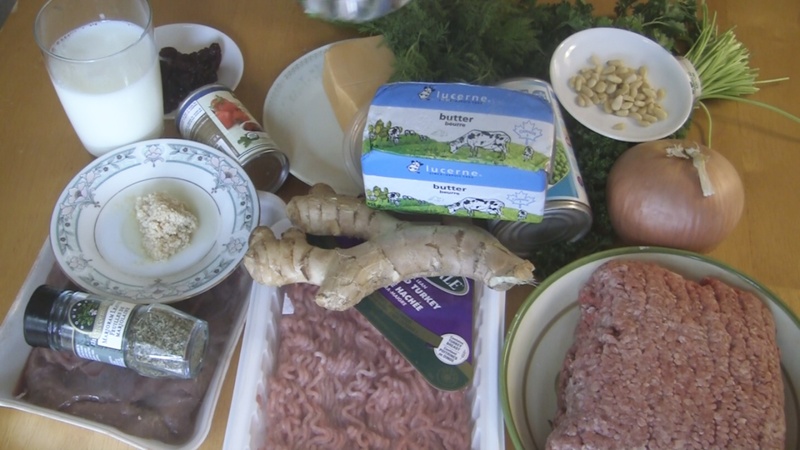 The beef kufta is inspired by Arabic cuisine. And all three cuisines love béchamel sauce. So here is what it looked like in the end. Ta Daaaaa! …… Grand Budapest Hotel Pastry in Meatballs. It was an experience eating this creation, since each layer tasted differently. A treat both for the eyes and the taste buds. Kufta – combine ground beef, ground onion, chopped parsley, salt and pepper. Form into balls and bake until cooked all the way through. Turkey Balls – combine ground turkey, ground ginger, chopped dill, salt and pepper. Form into balls and bake until cooked all the way through. Liver dumplings – Grind liver in the food processor. Combine liver, garlic, flour, marjoram. I attempted to form balls by hand but that process was messy. The I tried dropping the liver dumplings into boiling water by spoon. It was a much better method. Boil the dumpling in a slow simmer until fully cooked. As for the béchamel sauce, melt the butter, add flour and then combine with milk. Divide sauce into three batches. Add tomato paste into one, pureed green peas into another and grated cheddar cheese into third. This will create red, yellow and green sauces. Using a spoon cover beef kufta in red sauce, turkey balls with yellow and liver dumplings with green. Stack the meat balls and garnish kufta with capers, turkey ball with cranberries and liver dumpling with a single pine nut. I would consider The Grand Budapest Hotel Pastry in meatballs recipe a success, both in the visual department and in taste. When my daughter came home from school she took one look at the counter and exclaimed: “That looks like the desert in Grand Budapest Hotel.” I was so happy that she recognized the visual even through I didn’t tell her what I was doing. It made me feel accomplished. 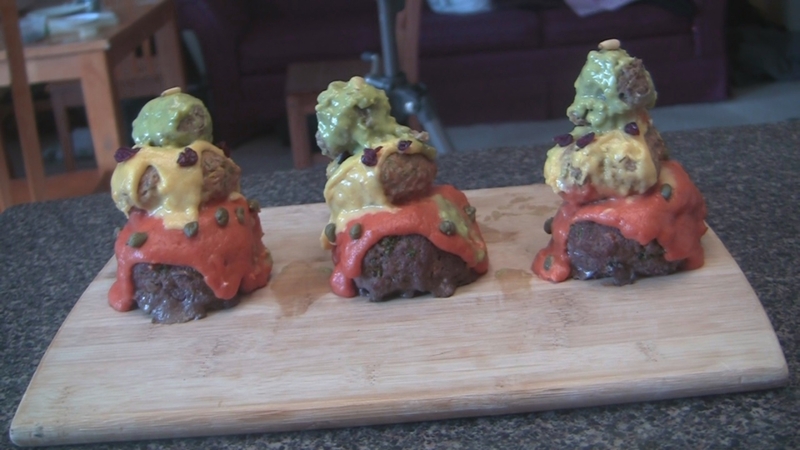 I do need to work on my meatball stacking technique. The top layer kept sliding off. The structure of the whole thing was not stable. Will try to think of a solution.